Inspired by video of a guy driving across the county, Brad A Schenck created a wonderful time lapse video of the bus ride that goes from Miami to Key West. Normally, the ride takes about 3 hours, but through the magic of video, Brad sped up the trip to just over 3 minutes. What’s great is, we still see all the famous sites, like South Beach, the Everglades, and the 7 Mile Bridge, it just doesn’t take as long to get there. Let Key West Bus Tour take you! Do You Have Questions About Visiting Key West? Are you undecided whether to drive yourself down, or take the bus? 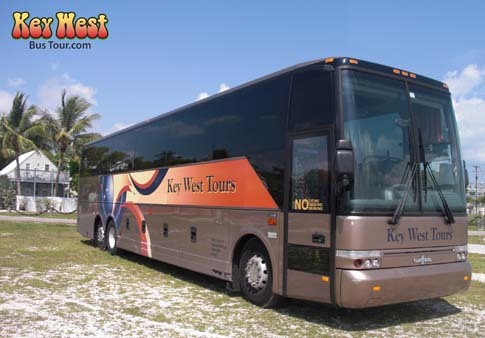 Post a comment below, or visit our new website KeyWestBusTour.com, a luxury motorcoach like this deserves a website of its own! "Go to Key West in Only 3 Minutes (Time Lapse Video)"
That’s pretty freakin’ cool. I’ve always wanted to see a time lapse video of the U.S. coastline by boat from Maine to Key West. This will do for now. Cool video! I love the music..if only the trip were that quick! Do you really pass through the Everglades on the Way to Key West? I guess I missed that driving with the boyfriend. I was busy assuming the crash position while he passed cars left and right. Awesome video, and the music goes perfect with it. Thanks guys and sungals! I’m happy you like it. The song is “Fi We Country” by Max Romeo… I heard it on my “Lee Perry” channel at Pandora.com.